Saigakukan is a traditional Ryokan nestling on the hillside on one side of Yufuin village, with superb views across the plateau to Mt Yukudake. With only 24 rooms, this ryokan has an intimate atmosphere enhanced by its authentic architecture and rural setting. Though the rooms are traditional in style, Saigakukan can offer western beds for maximum comfort. 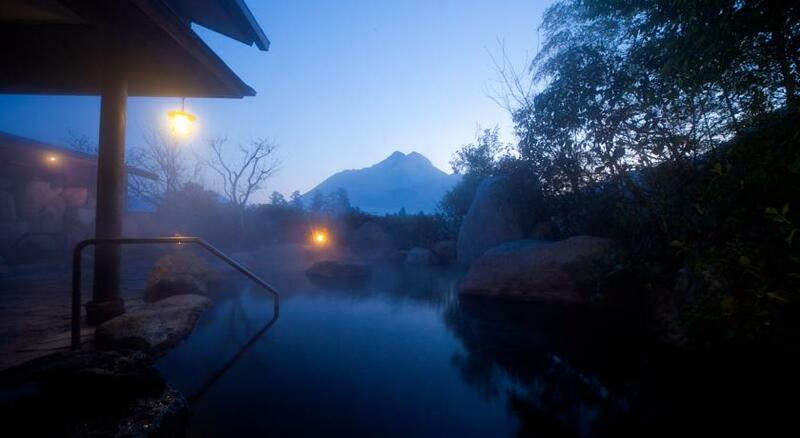 Saigakukan’s bathing experience is truly enhanced by the panoramic vista on offer from their outdoor hot spring baths. Guests who prioritise intimace will not be disappointed by the ryokan’s private baths, available in wood or stone. You are provided with “yukata” robes to change into after the hot spring baths, and it is traditional to wear these for the rest of the evening. The kaiseki dinner is served with many small dishes including seasonal vegetables, and all carefully prepared with exquisite presentation. Ingredients are locally sourced and mainly organic. After dinner you can relax in the quiet bar area, complete with a view onto a subtly lit Japanese garden.